Middle School programs are adventure based and designed to provide age related activities and increasing challenges as student’s progress through the years. Our school camp programs incorporate a range of adventure options which encourage students to move beyond their comfort zone and experience the rewards of achievement. Through challenge, at both a personal and team level, students experience enhanced self-esteem and confidence, improved communication skills and a greater sense of community with peers and teachers. NRAC can run joint programs where our staff provide guided instruction for adventure activities while teachers run aspects of the program such as leadership, effective time management, student health issues and religious studies. Curriculum components can also be incorporated by School staff where appropriate to optimise learning experiences. NRAC is owned and operated by vibrant, adventurous and experienced staff, who work with their clients to create a fun-filled and flexible program that meets the needs and skill level of its participants. All staff have a WA Working with Children Check, SLSWA Community Surf Rescue Certificate (Beach Bronze Medallion) and St John Ambulance Apply First Aid Certificate as a minimum. NRAC caters with a variety of fresh local produce such as seafood’s, fine Australian meats, fruits, and vegetables delivered through creative, home cooking methods. Providing we have notice, dietary issues such as diabetes, food allergies and vegetarian requirements are accommodated. At NRAC the safety and well being of students in our care is of paramount importance. We aim to provide students with a challenging and rewarding camp experience in a safe and nurturing natural setting. Read our Risk Assessment and Management Plan and Risk Management Plan Part 2. The first year of high school is a period of great change in the lives of students. For many, their experience in the transition from primary to secondary education will influence their future academic and personal success. For peer bonding among students from a diverse primary school feeder network. To give students an introduction to, and appreciation of, the Ningaloo Reef. To enhance student’s confidence and self-esteem. Our Year 7 camps are generally site based programs of 2 to 5 day duration, offering a range of activities such as snorkelling, beach walking, boat trips, outer reef snorkelling, marine interaction, environmental lessons, guest speakers, night games and informal play. These programs provide excellent groundwork for future Middle and Senior camps where students are offered more complex programs with increased emphasis on self-reliance. Our Year 8 camp programs are designed to the specific aims and objectives of the school. Camps generally incorporate similar activities to Year 7, but the program is enhanced to foster more teamwork, communication and self-confidence. Many schools have a specific agenda they need to incorporate in the camp program based on current school issues, for example, an anti-bullying policy or personal development programs. The camp environment provides for a “captive” audience where teachers can provide more formal instruction, perhaps with the use of audio visual presentations, and this message is reinforced by the nature of the activity program. For example, the Year 8 program may have an emphasis on team initiatives and other activities requiring interdependence among students for the success of the group. In these programs students learn that each participant’s contribution is vital if the group is to succeed in the task at hand. Other school issues, like good attendance and positive behaviour, can be rewarded by offering School Camp. The Year 8 program also provides students with greater confidence to explore physical activity and outdoor pursuits which, in the light of the current obesity epidemic, can only be a good thing for both the individual and the community generally. These programs provide excellent groundwork for future Year 9, and Senior School camps where students are offered more complex programs with increased emphasis on self-reliance. At NRAC we provide a range of outdoor education programs to support the National Curriculum? We provide opportunities for students to learn to snorkel in closed beach environments, then progressing to open-water beach snorkelling and outer reef snorkelling. Coral Viewing & Snorkelling on the World Famous Ningaloo Reef. Utilising local eco-tour operators (who provide evidence of Public Liability Insurance and staff with Surf Rescue Certificates), students can see the Ningaloo Reef up close. The Glass Bottom Boat offers coral and fish viewing and snorkelling, as well as relative information about the experience. 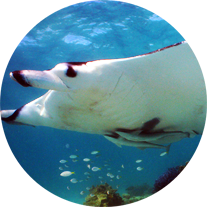 Coral Bay is well known as a prime location to experience swimming with these majestic creatures. More suited to confident swimmers and snorkellers, this is a once in a lifetime experience. As part of the Marine Interaction Tour included in all itineraries, students have an opportunity to view seasonal wildlife in their natural setting. The humpback whale migration is a prominent feature, as well as the chance to see dugongs, manta rays, sharks, turtles and other marine wildlife. Using well reputed local charter companies, students can fish the deep waters off Coral Bay, learning about the impact of commercial fishing, and the necessary bag-limits as part of a sustainable fishing for the future. Ideal as an exclusive charter, we can hire the whole vessel and bring home the catch to cook and eat at the Camp. We have a progressive program for schools interested in training students from introductory SCUBA programs through to Open Water certification. This was we can offer SCUBA to all age groups dependant on SCUBA experience. Alternatively, experienced divers can explore the outer reef on the Dive Boat. Another hands-on way to experience some of the closer snorkel spots is on a kayak tour. Using double kayaks and qualified instructors, students can work together on a paddling and snorkelling adventure. Why not challenge your student group to an outback experience? Camping under the stars, enjoying an open fire and incorporating a hike or boat trip to and from a camp site close to Coral Bay, can extend your students outside their comfort zone. This activity will be planned in conjunction with your School staff and follow all necessary safety requirements. See Coral Bay and surrounding areas on the Ningaloo Reef from the air and be amazed by the lands and seascapes. Even spot the natural wonders like manta rays, whales and whale sharks. Feel the rush aboard Coral Bay’s newest Tour! Climb aboard the inflatable rib and zoom to the outer reef for pristine snorkelling to view resident grey nurse sharks among coral and reef fish. Students and Teachers alike are raving about this fun and action-packed tour. Welcome to Ningaloo Reef Adventure Camps. The following Teacher Materials are an extremely important part of creating a successful camp for your students and yourselves. These materials are collected by Ningaloo Reef Adventure Camps and evaluated in order to ensure that the participating students get the most out of their camp. They enable Ningaloo Reef Adventure Camps staff to create a camp to suit all the participants and make necessary adjustments if needed. Ningaloo Reef Adventure Camps requires a 30% booking deposit at least 12 weeks before the commencement of the camp. Final payment is due during or just after the completion of camp. A 10% GST is placed upon the payments. A tax invoice is provided. Once a camp is booked and deposit received, and it is after the 12 weeks prior to planned commencement date, any cancellation will result inthe deposit (or portion of the deposit depending on the circumstances) not being refunded. If deposit is still required after the 12 weeks prior to commencement date, and camp is cancelled, NRAC still requires the deposit (or portion of depending on circumstances).